Being a member of the Salt Lake Chamber provides you with exceptional value and service. Now you also get to put the power of the world's largest business federation, the United States Chamber of Commerce, to work for your business. Take advantage of the nation's premier Small Business Center, get involved with grassroots advocacy that impacts small business and save money through members' only discounts. For more information about your joint membership, send an email to federation@uschamber.com. As a resident of Utah, you and your family have access to a statewide Prescription Assistance Program (PAP). This card will provide you with prescription medication savings of up to 75% at more than 56,000 pharmacies. Create and print your FREE discount prescription drug card. Maud's Cafe - 10% off Food and 20% off beverages! Enjoy 10% off food and 20% off drinks when you mention the Salt Lake Chamber when ordering food or beverage! Support the Community with dicounted food and drinks! Maud's Cafe - Enjoy $25 off Private Space Rental! Support the Community and enjoy $25 off private space rentals at Maud's Cafe when you mention the Salt Lake Chamber! We extend our offer throughout 2019 for all community members with 20% off on any products. 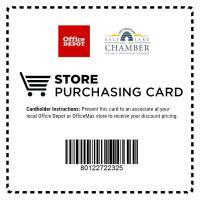 Help your company save on everything your office requires to be more productive through the Salt Lake Chamber / Office Depot business savings program. Members of the Chamber are eligible for this program, which helps you save on the cost of everything you need, streamline the ordering process, monitor expenses, and save time. Share Your Story is for business owners and entrepreneurs who want press coverage but don’t have big bucks to hire a PR agency or consultant. Goldman Sachs 10000 Small Businesses is a program for small businesses that links learning to action. Through the program, participants will gain practical skills in topics such as negotiation, marketing, and employee management that can immediately be put into action. In addition, they will receive the tools and professional support they need to develop a strategic and customized business growth plan that will take their company to the next level. You Built Your Business. We'll Help You Grow It! You Built Your Business. We'll Help You Grow It! Applications Now Open!